Dr. Kate Carter is a versatile performer based in Chicago with experience ranging from soloist to chamber and orchestral musician. A prizewinner in various competitions, Kate’s performances as soloist and with various ensembles have been heard across the US and internationally. She made her Carnegie Hall solo debut in February of 2014. As a concerto soloist, Kate has performed many times with the Elmhurst Symphony, with whom she is Assistant Concertmaster. Other concerto appearances have included the works of Beethoven, Sibelius, Mozart, Haydn, Saint-Saëns, Bloch, and more with the Mid-Columbia Symphony, Whiting Park Festival Orchestra, South Orange County Chamber Orchestra, and others. As an ensemble member, she has recorded for Cedille Records with Camerata Chicago, as well as the Chicago Jazz Philharmonic and Ensemble Nouvelle Epoque. She has performed with Chicago-area orchestras including the Grant Park Symphony, Music of the Baroque, and the Chicago Philharmonic Orchestra. 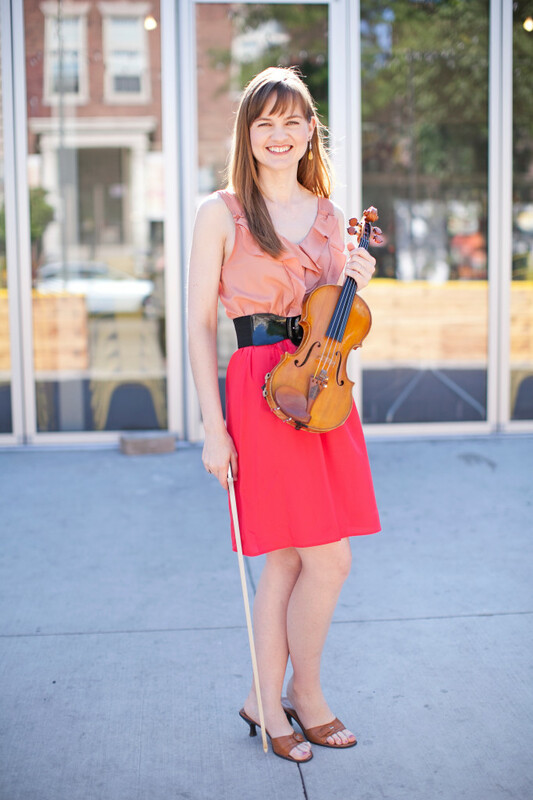 Kate is passionate about teaching violinists of all levels and has held teaching assistantships at the Eastman School of Music, Northwestern University, and the Meadowmount School of Music. She is a frequent guest clinician, adjudicator, and chamber music coach with various schools and youth orchestras in Chicago. She currently holds teaching positions at Lake Forest College, Northwestern University Music Academy, and her private studio in Evanston, Illinois. Her students have won top prizes at the Illinois Music Association State Olympics and are members of area orchestras including the Chicago Youth Symphony and Midwest Young Artists. In June 2016 and 2017, some of her top students performed in the Grant Park Young Artists’ Showcase alongside some 60 of their peers from music schools throughout Chicago. An in-demand speaker and clinician, Dr. Carter has lectured on peak performance and managing performance anxiety at the ASTA National Conference, ISMTA State Conference, Northeastern Illinois University, Chapman University, the Orange County School of the Arts, Marywood University, North Shore Music Teachers’ Association, and others. An avid chamber musician, Kate appears regularly in series throughout Chicago including the Chicago Cultural Center, Dame Myra Hess Series, Chicago Philharmonic Chamber Players, Fulcrum Point New Music Project, and Access Contemporary Music. She also frequently performs in recital with duo partner Louise Chan, with whom she looks forward to the release of their album of contemporary American music in Spring 2018. Kate holds a Doctorate of Music in Violin Performance from Northwestern University, where she received the Emma Peters Hooper scholarship and was teaching assistant to Gerardo Ribeiro. Kate received her Master’s Degree from the Eastman School of Music on scholarship, where she was teaching assistant to Lynn Blakeslee. Her previous instructors include Haroutune Bedelian and William Fitzpatrick.